Today is kind of a fun one. It’s #foodbloggerlove, when foodie bloggers from all over take the time to share the love! 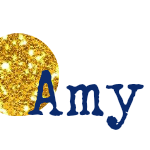 As part of the fun, participants have the option to do a blog swap and surprise another blogger by making a recipe from their blog and giving them a shout out! We can make Valentines inspired recipes or just something amazing! I was assigned Audrey’s blog, That Recipe. Audrey and I have a very similar philosophy when it comes to cooking. Like me, Audrey loves trying new recipes and while many of her recipes use healthy ingredients, there still plenty of delicious breads and desserts! Ready for the recipe? I chose one that I felt fit the bill of amazing and something I’d make for my sweetie on Valentines. Because these are bacon crusted bagels! How did I never think of this before? Over half the pretzels were gone within minutes. There were only some left because we were racing out the door shortly after these came out the oven! Um, I live in a house of carnivorous men who live and breathe bacon. Oh yeah, I was speaking their love language today! Don’t miss all the rest of the amazing #foodbloggerlove recipes found after the recipe! Place the water, yeast, and sugar in the bowl of a stand mixer, stir to combine. Set aside for 1-2 minutes or until the mixture starts to look foamy. Add the salt, bacon grease, and 2 cups flour. Mix with the paddle attachment until smooth. Switch to the dough hook and add the remaining ½ cup flour. The dough should pull away from the bowl and be tacky but not sticky. If needed, slowly add another ½ cup flour. Knead with the dough hook on low for 3-5 minutes or until the dough is smooth and silky. Divide the dough into 12 portions. Cover with a damp towel and allow the dough balls to rest for 5 minutes. 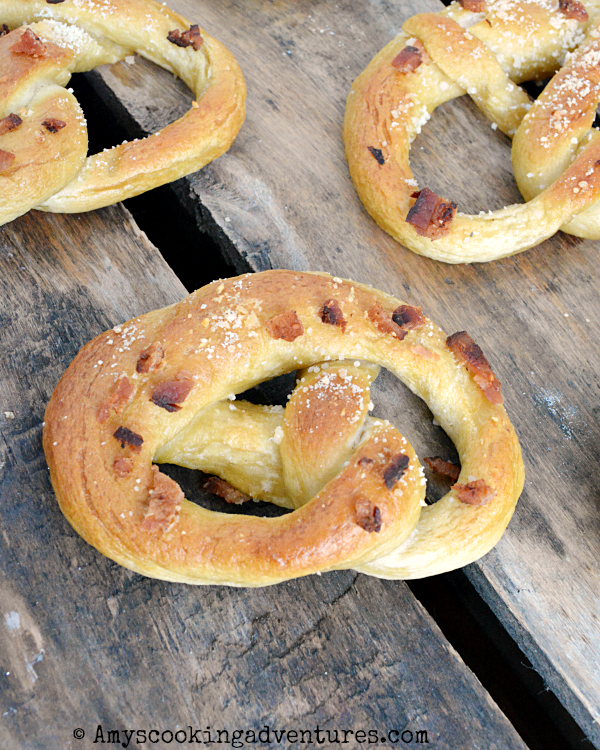 Roll the dough balls into long ropes and twist into pretzel shapes. Place the shaped pretzels on a baking sheet that is lined with parchment or a silicone mat. Cover the pretzels and allow them to rise in a warm place for 10-15 minutes or until light and slightly risen. Meanwhile, preheat the oven to 400 degrees F and bring the water to a boil. Once the water is boiling, add the baking soda. Once the pretzels have rested, add them to the boiling water, 2-3 at a time (depending upon the size of the pan). Boil for 30 seconds, flip, and boil for another 30 seconds. Scoop the pretzels out of the water and place back on the baking sheet. Repeat with remaining pretzels. 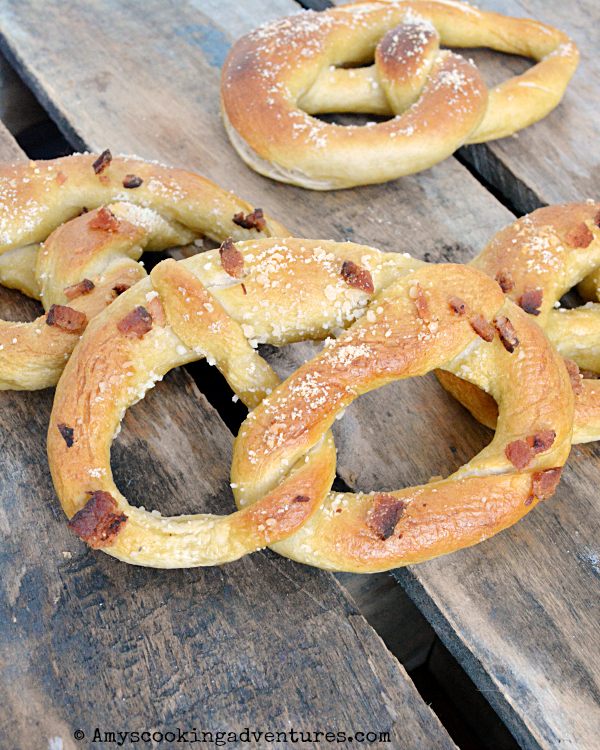 Lightly brush the pretzels with milk and sprinkle with minced bacon and parmesan. Bake the pretzels for 10-15 minutes or until deeply browned. Cool slightly and serve. Place the water, yeast, and sugar in the bowl of a stand mixer, stir to combine. Set aside for 1-2 minutes or until the mixture starts to look foamy. Add the salt, bacon grease, and 2 cups flour. Mix with the paddle attachment until smooth.Switch to the dough hook and add the remaining ½ cup flour. The dough should pull away from the bowl and be tacky but not sticky. If needed, slowly add another ½ cup flour. Knead with the dough hook on low for 3-5 minutes or until the dough is smooth and silky.Divide the dough into 12 portions. Cover with a damp towel and allow the dough balls to rest for 5 minutes.Roll the dough balls into long ropes and twist into pretzel shapes. Place the shaped pretzels on a baking sheet that is lined with parchment or a silicone mat.Cover the pretzels and allow them to rise in a warm place for 10-15 minutes or until light and slightly risen.Meanwhile, preheat the oven to 400 degrees F and bring the water to a boil. Once the water is boiling, add the baking soda.Once the pretzels have rested, add them to the boiling water, 2-3 at a time (depending upon the size of the pan). Boil for 30 seconds, flip, and boil for another 30 seconds. Scoop the pretzels out of the water and place back on the baking sheet. Repeat with remaining pretzels.Lightly brush the pretzels with milk and sprinkle with minced bacon and parmesan.Bake the pretzels for 10-15 minutes or until deeply browned. Cool slightly and serve. Bacon and carbs, now that's a Valentine's day treat! OMG - the bacon grease in the dough must have been amazing!! !